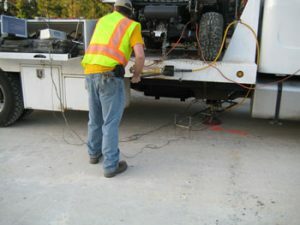 The mounted static plate load testing (PLT) device allows Geotechnical Mobile Lab staff to conduct fast, simple and accurate field tests without having to rely on additional equipment. 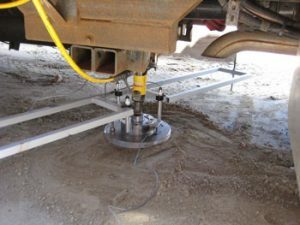 The PLT, attached to a custom frame on the Geotechnical Mobile Lab’s Freightliner truck, leverages the truck’s weight to take in situ measurements of a soil’s modulus of subgrade reaction (k). This important value indicates the amount of support that the soil can provide to structures built above and helps determine whether additional stabilizing materials or soil treatments may be needed. 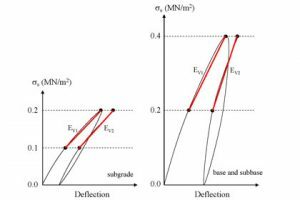 Additionally, data from this PLT test can be combined with other soil data to derive the modulus of elasticity (Ev1/Ev2), a measure of the soil’s ability to retain its shape when compressed. 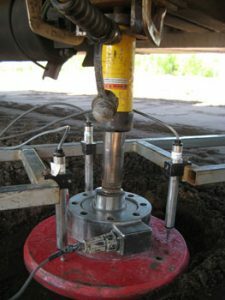 The PLT device consists of a custom load frame for stability, a hydraulic jack and bearing plate to create a load force, transducers to measure soil response, and a system for processing response data. The DAS receives the voltage signals measured by the LSCTs, converts the signals into displacement readings, and logs the data for analysis. With the displacement data recorded by the PLT device, a user can graph the load applied by the hydraulic jack versus the displacement of the plate. This graph can then be used to indicate the soil’s k value and, with the help of other data and assumptions, the soil’s Ev1/Ev2 value. A 20,000 lbs hydraulic jack produces the force needed for testing by interacting with a load cell, which measures the actual load being applied during the test to ensure accuracy. The load cell sits on the bearing plate, the part of the device that presses into the soil. Two different plates are available for the PLT device, 300 mm or 200 mm. The 300 mm plate is used for most soil testing, but the 200 mm plate can be used when greater pressures are needed to induce bearing capacity failure. When a load is applied to the plate, the plate displaces a certain amount of soil. The amount of soil displaced under a given load indicates the soil’s k value, or the amount of support the soil can provide to the structures and loads pressing down on it. Using this process, the device can measure both the subgrade and the sub-base at a construction site. Three 50 mm linear strain conversion transducers (LSCTs), wired to a processing computer, measure the plate’s displacement. The LSCTs are spaced evenly around the plate. Each LSCT is a round instrument with a pin at one end that touches the plate, and each pin is equipped with a spring diaphragm. When a load is applied to the plate, the plate pushes into the soil, the soil pushes back, and the pin is driven into the LSCT. The LSCT then measures a change in voltage correlated to the pin’s movement and sends that information to the data acquisition system (DAS). Each LSCT acquires data at one voltage reading per second. Using this method, an operator can measure one data point, or a discrete area of soil, every two minutes. Download a technical brief about this facility.